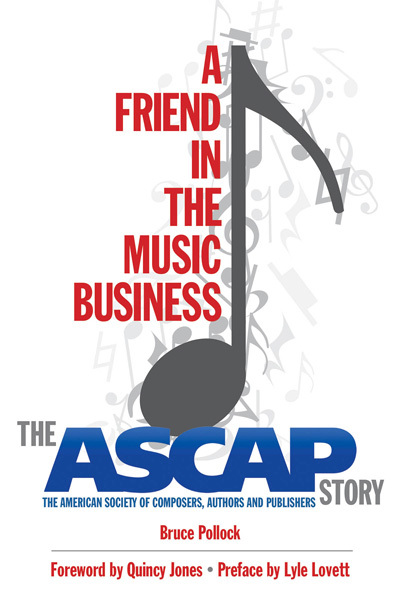 Bruce Pollock understands the importance of having a “Friend in the Music Business.” ASCAP has been that integral supporter of songwriters and musicians for 100 years now. Bruce contemplates the absolute importance of ASCAP’s contribution to the music business in an article he wrote for Grammy.com, which also includes excerpts from his book – A Friend in the Music Business: The ASCAP Story. Read the rest of the article here. You don’t get to be around for 100 years in the entertainment industry by living in the past. John LoFrumento, CEO of the American Society of Composers, Authors and Publishers, which joined that rarefied rank earlier this year, certainly agrees. With an ongoing mission that includes protecting “the rights of ASCAP members by licensing and distributing royalties for the nondramatic public performances of their copyrighted works,” ASCAP has remained relevant by expanding into the realms of talent discovery and development, augmenting its original mission with a mix of conferences, workshops, showcases, networking events, and annual awards. The ASCAP Foundation’s Musical Theater and Television & Film Scoring Workshops have emerged as highly regarded proving grounds for young talent. Launched in 2006, the annual “I Create Music” Expo has become ASCAP’s signature event. Taking place in April, the 2014 expo featured keynotes, panels on a variety of topics, performances, networking receptions and exhibits, with participants including GRAMMY winners Shane McAnally, Amy Grant, Jimmy Jam & Terry Lewis, and Jermaine Dupri, among others. I first joined ASCAP in 1955. I had previously spent a lot of time in France, and I knew about SACEM (Société des Auteurs, Compositeurs et Éditeurs de Musique), the French equivalent of ASCAP. I heard the United States had their own version of it, so that’s why I became a member. Also, many other composers and songwriters that I was familiar with were members too, like Duke Ellington and Count Basie. For nearly 60 years, I’ve worked as a producer, arranger, songwriter, and composer in almost every musical style—including pop, jazz, R&B, rock ’n’ roll, and classical—and in all media forms, including records, film, and TV. It’s been an amazing journey. And through it all, ASCAP has always been there for me, making sure I received fair compensation for my work, thereby ensuring I could continue to work and grow as a creative artist. This has always been their main role—to be the champion for all their member songwriters and composers. But in today’s music business, there is a proliferation of piracy everywhere in the world. Songwriters and music industry professionals are challenged to stave off this epidemic, because the means for producing, replicating, and disseminating intellectual property such as music is so quick, easy, and accessible to everyone. In this climate, the challenge is, how do songwriters and composers continue to be properly compensated for their work? The solutions are not easy to find, but if we don’t discover them, there aren’t going to be songwriters to write the great songs of the future. That’s why ASCAP is absolutely as essential now as it ever was and maybe even more so. It’s a gamechanging time throughout the business, with people reluctant to pay for various uses of music. That’s why it’s important for ASCAP to persevere—to make every effort to work with the entire music industry, as well as legislative bodies, in making sure songwriters continue to be treated fairly in terms of appropriate compensation. So far, for the first 100 years of their existence, they’ve done a great job; they’ve consistently worked very hard to represent us at every turn, whenever there’s been a challenge to our right to make a living from our creative work. ASCAP has their hands full, but they keep working at it and finding solutions. As songwriters, we certainly need them. They are essential to our existence. I talk to young songwriters all the time. I tell them don’t forget God’s rules, and that’s to have humility with your creativity and grace with your success. Start with that. That’s very important. Then I tell them join ASCAP and you’ll get protected from piracy, because ASCAP is a rights protection organization. I tell them ASCAP will champion your right to earn a living on your creative work, and what’s more, will collect revenue on your behalf for that work. Right now, as a society, we are not respecting the rights of songwriters—that they need to be compensated for their intellectual property, which is their songs and compositions. The world is running outside the boundaries of the concept of intellectual property rights, and we’ve got to get back in them, because it’s about respect for people’s property and the morality of not just stealing it because it is so easy to do. But even though the business is in trouble, young songwriters are creating great music. Music and water will be the last things to disappear from this planet. People can’t live without music. So we’ll need ASCAP to be doing their job until the very end. I was so honored when I received the ASCAP Founders Award in 2013. Some incredible musicians have been recipients of this prestigious honor. ASCAP has an amazing legacy and a long heritage of nurturing and supporting the creative process. That’s why I try to do as many ASCAP events as my schedule permits. We all need to do our part to keep ASCAP visible and in the public’s eye, so everyone knows how important it is that they are there. I was elected to be on the board of ASCAP, but at the time I was in the middle of an incredibly heavy workload, especially working with Michael Jackson and all my other endeavors in the ’80s. So I wrote a long letter to ASCAP recommending that Marilyn Bergman take my place on the board—which she did, and not surprisingly, she later became an awesome president and chairman of ASCAP for a period of fifteen years, until 2009. (Currently, Paul Williams has taken the reins and is continuing to do a wonderful job.) I’ve known Marilyn and Alan Bergman since we were next-door neighbors and worked together on the songs for In the Heat of the Night in 1967. She’s like family. I knew she’d be right for the board because I knew her soul, her mind, and her God-given gifts. She definitely has a leader’s mind. She’s brilliant. You can hear it in her lyrics. For nearly 60 years, I’ve worked as a producer, arranger, songwriter, and composer in almost every musical style – including pop, jazz, R&B, rock ’n’ roll, and classical – and in all media forms, including records, film, and TV. It’s been an amazing journey. And through it all, ASCAP has always been there for me, making sure I received fair compensation for my work, thereby ensuring I could continue to work and grow as a creative artist. This has always been their main role – to be the champion for all their member songwriters and composers. But in today’s music business, there is a proliferation of piracy everywhere in the world. Songwriters and music industry professionals are challenged to stave off this epidemic, because the means for producing, replicating, and disseminating intellectual property such as music is so quick, easy, and accessible to everyone. In this climate, the challenge is, how do songwriters and composers continue to be properly compensated for their work? The solutions are not easy to find, but if we don’t discover them, there aren’t going to be songwriters to write the great songs of the future. That’s why ASCAP is absolutely as essential now as it ever was and maybe even more so. It’s a game-changing time throughout the business, with people reluctant to pay for various uses of music. That’s why it’s important for ASCAP to persevere – to make every effort to work with the entire music industry, as well as legislative bodies, in making sure songwriters continue to be treated fairly in terms of appropriate compensation. So far, for the first 100 years of their existence, they’ve done a great job; they’ve consistently worked very hard to represent us at every turn, whenever there’s been a challenge to our right to make a living from our creative work. ASCAP has their hands full, but they keep working at it and finding solutions. As songwriters, we certainly need them. They are essential to our existence. I talk to young songwriters all the time. I tell them don’t forget God’s rules, and that’s to have humility with your creativity and grace with your success. Start with that. That’s very important. Then I tell them join ASCAP and you’ll get protected from piracy, because ASCAP is a rights protection organization. I tell them ASCAP will champion your right to earn a living based on your creative work, and what’s more, will collect revenue on your behalf for that work. Right now, as a society, we are not respecting the rights of songwriters – that they need to be compensated for their intellectual property, which is their songs and compositions. The world is running outside the boundaries of the concept of intellectual property rights, and we’ve got to get back in them, because it’s about respect for people’s property and the morality of not just stealing it because it is so easy to do. But even though the business is in trouble, young songwriters are creating great music. Music and water will be the last things to disappear from this planet. People can’t live without music. So we’ll need ASCAP to be doing their job until the very end. I was elected to be on the board of ASCAP, but at the time I was in the middle of an incredibly heavy workload, especially working with Michael Jackson and all my other endeavors in the ’80s. So I wrote a long letter to ASCAP recommending that Marilyn Bergman take my place on the board – which she did, and not surprisingly, she later became an awesome president and chairman of ASCAP for a period of fifteen years, until 2009. (Currently, Paul Williams has taken the reins and is continuing to do a wonderful job). I’ve known Marilyn and Alan Bergman since we were next-door neighbors and worked together on the songs for In the Heat of the Night in 1967. She’s like family. I knew she’d be right for the board because I knew her soul, her mind, and her God-given gifts. She definitely has a leader’s mind. She’s brilliant. You can hear it in her lyrics. On February 13, 1914, a group of the nation’s most distinguished and popular songwriters gathered together in New York City to support the mission of ASCAP, a new organization for publishers and songwriters. A few years later, ASCAP received its mandate from the Supreme Court to collect royalties for the public performance of copyrighted material. Over the course of the next century, ASCAP has been as prominent a force for the advancement and nurture and financial well-being of songwriters as any record label or publishing outfit one would care to name. With a responsive board of directors made up entirely of songwriter/composer and publisher members, ASCAP has defended creators’ rights at every turn against those who would seek to devalue music. Today, with copyright under renewed assault, its mission is as resonant and vital as ever, along with its relatively new role as a nurturer of the young artists who represent the future of music. Legendary record producer George Martin is 88 years old today! Enjoy this excerpt from If You Like the Beatles… to celebrate. When the Beatles first met George Martin, no one could have been a more unlikely candidate to produce their records. At 36, he was nearly twice their ages. From his patrician upbringing to his choice of neckties, the Parlophone Records producer and talent scout had a style and stature that was diametrically opposed to the young Liverpudlian upstarts. But Martin and the erstwhile super group (especially John Lennon) clicked, partly because of a shared passion for the lunacy of the BBC’s The Goon Show. Martin’s involvement with the Goons wasn’t just as a fan and a devotee; he’d actually produced records for the Goons, including their classic album The Bridge on the River Wye, which spoofed the Academy Award-winning movie The Bridge on the River Kwai. Martin was a friend of Spike Milligan, the show’s creative voice, who he met through Peter Sellers (whose early Parlophone albums Martin also produced). The breakout single from Sellers’ second album was a parody of Lonnie Donegan’s recording of “Puttin’ on the Style,” a nineteenth-century pop song that was in the early repertoire of the skiffle-mad Quarrymen. Later on, Sellers did one of the first covers of “A Hard Day’s Night,” performed in the style of Sir Laurence Olivier as Richard III. The affliction with the Goons immediately endeared Martin to John Lennon, who was just entering adolescence at the time the Goons took to the airwaves, and whose view of reality was inalterably shaped by their mind-expanding programs. The myriad sounds rattling around inside Spike Milligan’s mind were accomplished through the insidious use of ingenious sound effects, engineered through a mastery of echo, reverb, multiple edits, and playing with recording tape speeds, all of which would become hallmarks of the Beatles’ studio repertoire, and especially, John Lennon’s mad, unspooling, and acid-soaked creative vision. To be a Goon Show freak turned out to be an absolute requirement for producing the Beatles, as the group grew and changed, and as their studio techniques (and minds) expanded. Martin’s appreciation for comedy and studio wizardry may have found a kindred spirit in John Lennon, but his classical training (on piano and oboe) and fondness for film scores made an impression on the more tradition-minded Paul McCartney. As a fan of Johnny Dankworth’s 1960 score for Saturday Night and Sunday Morning (another “kitchen sink” drama à la A Taste of Honey), Martin produced Dankworth’s “Experiments with Mice,” jazzy variations on “Three Blind Mice” that hit the Top 10 in the UK in 1956. In 1961 Dankworth wrote the theme for the popular British TV spy series The Avengers. That same year Martin produced Danworth’s first Number One record, a version of the jazz standard “You’re Driving Me Crazy,” performed by a nine-piece trad band called the Temperance Seven, which featured vocalist Paul Macdowell. The Dankworth-Martin association continued in 1976, when Martin produced the album Born on a Friday for Dankworth’s wife, jazz singer Cleo Laine. The Beatles came up in the rock and-and-roll era, when Chuck Berry, Little Richard, and Elvis Presley defined cool. Their early shows were big beat bacchanals, the Brit interpretation of that crazy American sound. But it wasn’t long before they were absorbing and creating more and more music – from folk to experimental, to psychedelia and hard rock, quite literally changing music forever and influencing hundreds of great bands in the process. This is the first book for music lovers that begins with the simple premise, “If you like the Beatles . . . ,” and takes off from there, digging into their influences and everything that came after them, opening up new doors for listeners looking for no-risk discs to expand their collection. Beginning with the Beatles’ lesser-known roots in rockabilly and Tin Pan Alley, and working through American R&B, the British Invasion, California folk, and the Summer of Love, and to the great pop and rock bands of the ’80s, ’90s, and the 21st century, this is a must-have for anyone who likes the Beatles, which is…everyone. Guest Blogger: Bruce Pollock is the author of, If You Like The Beatles. Below is an excerpt from his blog. By the fast and loose standards of rockabilly, Elvis Presley’s ride from fame to fortune has to beconsidered nearly exemplary, if not virtually domesticated. Long since revealed in his many biographies as a simple good old boy trapped in a Graceland not entirely of his own making, Elvis was nonetheless extremely sensitive, insecure, and competitive about his place in the rock and roll scheme of things. While Carl Perkins lay in a near coma in a New York City hospital, Scotty Moore, Bill Black, and DJ Fontana, in town for a gig with Elvis, came to call, bearing Elvis’s good wishes. But no Elvis. Weeks later he sent a telegram wishing Perkins a speedy recovery. Did he harbor a grudge that Carl’s version of “Blue Suede Shoes” outpaced his own on the charts? Or that Carl released it at all? Who knows? But is it a coincidence that Elvis never recorded another Carl Perkins song (while the Beatles recorded more than half a dozen)? When the Beatles finally met The King in the summer of 1965, when they were both ensconsed in separate huge mansions in Los Angeles, it was like two pop cultural ships in the night, circling each other, the one bound for glory, the other heading for a reef in the middle of the North Atlantic. It had to be a tense, stilted afternoon. Whereas a year earlier, Bob Dylan had famously turned them on to pot, Elvis apparently didn’t offer them so much as a peanut butter and banana sandwich. On the other hand, the lads were probably already stoned when they arrived. And Elvis may have been loaded on a cocktail of barbiturates. The Memphis Mafia was there, all of Elvis’ childhood pals. The color TV was on with the sound off. Muddy Waters was on the stereo. The Beatles played pool with El’s bodyguards. Elvis played some bass and the fellows eventually jammed and talked gear. Priscilla stopped by to curtsey like a proper housefrau. Elvis had met her when he was 25 and she was 14. They didn’t marry until she turned 21, in 1967. On their way out, Elvis gave the Beatles souvenir holsters. For more please visit Bruce Pollock’s blog. Welcome to February. You will be hearing a lot of Beatles on the radio this month in the States in celebration of the Beatles conquering America. Listen now to Bruce Pollock, author of If You Like the Beatles…, on Outsight Radio. On the Kevin Bacon celebrity thermometer, my closest link to the Beatles as the Beatles is Roger McGuinn, founder of the Byrds, who hung out with them in hotel bathrooms and elsewhere in the ‘60s. I interviewed McGuinn for my book, When the Music Mattered: Portraits from the 1960s, which was published by Holt in 1982 and now available as an e-book. “George didn’t believe in anything when I first met him,” McGuinn recalled. Which is a convenient echo of the oft-uttered line: “If you can remember the ‘60s, then you weren’t really there,” attributed by The New York Times to comedian Robin Williams. I’d go even further. “If you can remember the ‘70s, you weren’t really there either.” Which, I think, is even more accurate, since the ‘60s didn’t start being ‘The ‘60s’ until 1966 or so, while the ‘70s lasted about 20 years, none of which I remember that well. For instance, I only vaguely recall coming into contact with close John Lennon associate May Pang in the mid-‘70s–or at least someone in her office–who may or may not have approached me to ghostwrite a tell-all book about John Lennon, in the voice of a loose cannon within his entourage. Did we ever have a meeting? Was I ever inside her office? And if so, did I bring anything with me? These details are lost. That Lennon and I may have had a connection was brought home to me a few years ago. While indulging in my favorite sport, trolling the internet for my name, I uncovered a mention of a Beatles memorabilia auction that took place in Japan on March 22, 1999. There it was, on page 24 of the list of items sold, “Lot 239: John Lennon’s proof copy of Lyrics and Lyricists 1955-1975, In Their Own Words by Bruce Pollock” which went for the whopping sum of 150,000 yen. (It was whopping even in American dollars, translating into 1215 big ones, not that I ever got a royalty from it). Just to put this in a little bit more perspective, the stuff that sold that day went from Paul McCartney’s birth certificate (9 million yen) to the complete Volume 1 of Mersey Beat Magazine (90,000 yen) to a copy of the censored “butcher block” cover of Yesterday and Today (150,000 yen).To have had a proof copy in his possession, someone at my publisher, Macmillan, must have sent it to John. And they wouldn’t have sent it to him unless he or someone at his office requested it. There’s no way he would have had a proof copy in his possession unless, as I said, I left it as a calling card after my meeting. In any case, although the tell-all never came out, Lennon held onto the book until he died. Whether he read it, or even cracked open a page, I can’t say. But he didn’t toss it. A few years before my fabled interview with McCartney, in which Paul referred to his career with Wings as “a second bite of the cake,” I had a much more difficult and frustrating encounter with the Beatles’ “gang” mentality. One that, to be successful, would have required a feat on a par with reuniting the Beatles! Embarking with designer and humorist and Music and Art classmate of Laura Nyro, John Wagman, on a coffee table book called The Face of Rock & Roll: Images of a Generation, we set out to portray the secret history rock and roll through the use of a magnificent array of diserningly selected album covers. Just glancing through the book now gives me chills. But the chills are reserved for when I remember what occurred about midway into the project. This is when we got word from the lawyers at Holt that the use of any cover in the book might need as many as three different permissions, one from the record label, one from the cover’s photographer, and one from the artist (or, if it was a group, each artist in the group). I’m not sure what they said about getting a release as well from anyone else pictured on the cover, Suze Rotolo, for instance, on Bob Dylan’s Freewheelin. I had probably dropped the phone by then and lapsed into a coma (which explains why the rest of the ‘70s, as well as the ‘80s and ‘90s went by “in a bit of a blur for me”). We had collected, by that point, over 900 releases. But this new directive would have required about 4,000 more. Needless to say, in the true spirit of the age, we said, ‘The hell with it,’ and put the book out anyway and the only person who complained was a lawyer for Buffy Sainte-Marie. When it came to the Beatles, however, we weren’t about to take any chances. If we couldn’t effectively reunite them with four separate signatures, we’d have to revert to plan B (which did not include any hejiras to Liverpool). Owing to my good graces within the Lennon camp, John’s signature was the first to arrive. Ringo being Ringo, he didn’t have any problem with the concept. Always on the lookout for his best interest, Paul surprised both of us by coming through on the bottom line without complaint. With three of the four signatures in hand (note to John Wagman: have you still got those signatures? I have Japan on the line), surely George, the acquiescent baby brother, would have to follow. But as the days went by, with the deadline passing, no letter from George arrived, and thus we had to go to press Beatleless. I was nevertheless generous in my essay that accompanied those pages in which solo album covers from Ringo, Paul, and John substituted for Sergeant Pepper and Rubber Soul. “In the collective absense of the Beatles, their American audience has been given what it really wants. Instead of an actual reunion concert and tour they’ve been handed a stage play–Beatlemania–four imitation Beatles, harmonizing nightly for parents and kids and grandchildren, evoking those faintly remembered strains of long ago. See, the people must intuitively understand that if the Beatles did really reunite for a show or a tour, they’d inevitably disappoint, perhaps depress. And no one wants to see the Beatles going out like Willie Mays, pathetically swinging for the fences only to produce a scratch single. “So John and George and Ringo and Paul have had their championship seasons, seven of them–giving Tin Pan Alley its greatest dynasty. And now their number jerseys have been retired. “Obviously, there are a lof of people who would like to see the Beatles get back together, but it’s virtually a physical impossibility now,” Paul was kind enough to address the issue in Family Weekly in the spring of 1980. Maybe he was referring to the drug charges that might have kept him out of America. But I doubt those would have stuck. A few months later, though, he’d be all-too sadly prophetic. Beginning with the Beatles’ lesser-known roots in rockabilly and Tin Pan Alley, and working through American R&B, the British Invasion, California folk, and the Summer of Love, and to the great pop and rock bands of the ’80s, ’90s, and the 21st century, this is a must-have for anyone who likes the Beatles, which is…everyone. Available for purchase here.